I am most inspired by nature and my native Texas heritage. I work with copper, sterling, semiprecious gemstones, Czech glass and vintage components. 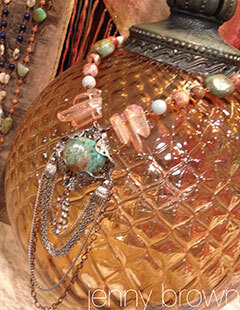 I love working with metal and the texture, color and richness of stone. I'm also a sucker for most things vintage, whether they are fine antiques or roadside junk ... I'm all about it! I sell my designs online through my Etsy shop. I also travel to several vintage/junk markets throughout the year, including Texas Antiques Week, twice a year, where I set up in Warrenton, Texas in the Zapp Hall area. I call this one Gypsy Queen. Several things inspired this design. I am a huge fan of the television series Game of Thrones. This piece was mainly inspired by the character Khaleesi. She is brave, beautiful, caring and a true gypsy queen herself. The colors of turquoise and orange/peach have really spoken to me lately as well and they made their way into this design. This design truly defined itself as I began working on it. There was never a set plan. I added elements and took others away until I was happy with it.